The SMART concrete design software for Reinforced Concrete structural calculations. 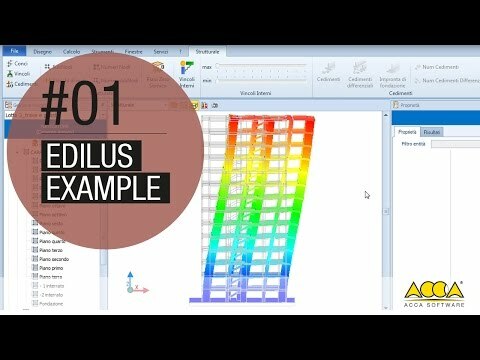 EdiLus-RC is the concrete design software solution that addresses structural calculations for both new and existing buildings in reinforced concrete with the most simple and effective SMART BIM object input. A single software solution for new and existing reinforced concrete buildings. You can design and calculate new buildings, but also carry out checks and structural redevelopments of existing reinforced concrete buildings with cladding work, platings, FRP interventions, etc… Specific functions guide you in acquiring information about the existing structure, the material strengths defining its reinforcements. You can add new roof structures to the existing building, elevations, or even extra floors, etc., and then move on to an overall verification. Finite Element Method solver integrated in the software. A FEM solver is included in the software to give a unitary experience in structural design. Graphical input, the static and dynamic calculations, structural analysis, modifications and construction documents (charts, tables and reports) are all produced with the very same software in a simple and integrated manner. Each object can be displayed with its stress and deformation values after the calculation process. In addition to the detailed calculation results in numerical form, EdiLus also provides various graphical views that allow you to understand how the structure works at a glance. Optimizing the static or dynamic behaviour of the structure is made easy and intuitive. Design with intelligent objects that contain information relating to their characteristics of resistance and spatial location. Modelling of complex spatial structures is made easier by means of Magnetic Grids, the powerful tool that allows you to build a network of magnetic points in space where to which the various structural elements are automatically connected to. EdiLus-RC checks structural elements sections according to the EUROCODES technical provisions and regulations. Structural engineers can easily choose the national annex and the response spectrum in relation to the country in which the calculations is to be performed. The modelled structure produces a dynamic Bill of Quantities automatically, in fact, the entire project, and any subsequent variations, are immediately updated in the project’s cost estimate. By integrating EdiLus in Edificius, Architecture and Structural engineering issues can interact allowing the structural engineer to design and calculate all the structural elements with great precision.